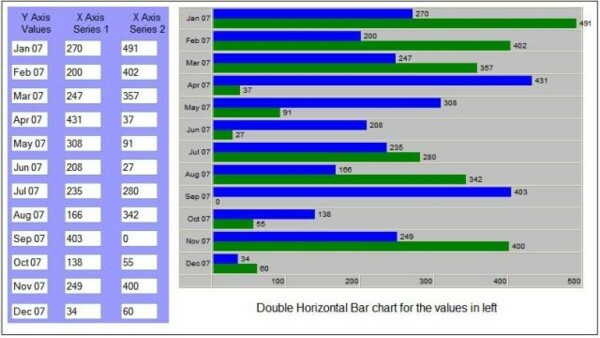 Here we are going to look at the steps we need to follow to have effective HTML-based horizontal bar charts. We are first going to see how we can generate the chart for one data series pair, i.e. a chart for a series that has Y-axis values and corresponding X-axis values. Later we are going to take a step ahead and see a chart for the series that has Y-axis values and a corresponding "set" of X-axis values. So let us get into action. <DIV>s and <P>(the HTML paragraph tag). It is basically a set of <DIV>s and <P>s placed inside the <TD>s of HTML table <TR>s. This chart table needs only two columns in the desired number of rows. The first column will contain the axis values and the other will contain the <DIV>s with colorful backgrounds of the desired width to represent a bar in the chart. The values on each bar can be displayed with the <P></P> tags. Let us cook up this chartstep-by-step. Determine how many rows you need in the table by determining the number of items you want to have in the chart. Let us say you got rowNum as the number of rows you need. In the example attached, it is 12. In the first column, add a <DIV> or <P> with labels for the Y-axis. with background color as blue and with width the same as that of the X-axis value, along with a <P> tag with the value to display after the blue bar. 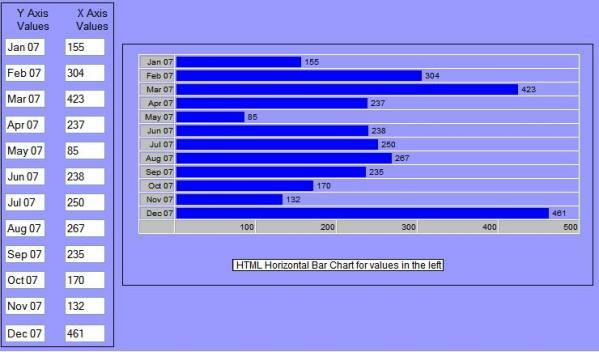 This is the gist of the entire HTML horizontal bar chart. Steps 4 and 5 are repeated for each Y-axis value and then our bar chart is ready. Well, HorX[i] is used directly as width in the attached demo, but as per requirement it can be reduced/increased proportionately. Say, for example, that you have only a limited area for displaying the chart. You may consider dividing the width of the blue <DIV> by, say, 2 or 3 in the loop for each row. Note that the bar chart is all about displaying the data proportionately. The bar for value 10 should look half the width of a 20-valued bar. Now it won't be too hard to understand how to generate this double bar chart. In the same <TD> of Step 5, rather than adding one <DIV> and <P>, we need to place two <DIV>s and <P>s. The width of the second <DIV> should be guided by the second array of information. There is an Internet Explorer setting that determines whether the printing of images and <DIV> background colors is to be allowed. By default, IE settings do not allow the printing of background colors. To change this setting in IE 6, go to the "Tools" menu of IE, select "Internet Options..." and then select the "Advanced" tab. Now scroll down to the "Printing" section and check the checkbox for "Print Background Color and Images." We have the equivalent for this in IE 7 and other good browsers. Please spare some time to rate and provide feedback about this article. Your couple of minutes can really help enhance its quality. One of the best articles posted in dotnetspider recently. Keep up the good job. Very Good Stuff, i got really a very good idea regarding how we can create good web applications using HTML and scripting languages. its really very good stuff. Nice code. But it works only with Auto-Filled data. It does not work when customised data is fed. Instead it randomly fills data. this stuff is really useful.